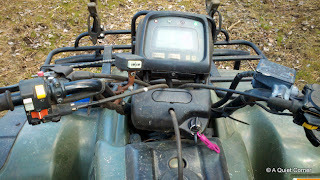 Trust me, there's no need to ask twice when it comes to riding/driving the ATV...not for me anyway! I was on it faster than you can imagine!! However, there was no racing around or taking corners on two wheels or steep hills to climb. No playing today. Today was yet another day of YARD WORK! I've been thinking a lot about our Home in the Hollow down in Virginia and all the time we had to sit around and do nothing. Then it dawned on me. We did bust our butts on creating the yard for the first few years we were there. As the Pres planted most of the fruit trees, the vegetable garden and both the black raspberry and blueberry bushes, I did all of the perennials and shrubs in the entire yard. Here...this year...I sometimes wonder IF we'll have GRASS! LOL! Gosh, we're pooped at the end of the day! But you're not bored are you? i will drive, you do the yard work. LOL and do you want to drive are words never spoken to me by my husband because if i am in the car/truck I am driving because i refuse to ride with him at the wheel. This time next year you will be complaining about mowing the grass. Calm down, enjoy the journey. Your yard is a blank canvas waiting for you guys to paint a beautiful picture. Maybe now is the time to enjoy the ride.